Because the Missouri Senate is a private club and the public has no business hearing about their business? Because the Missouri Capitol News Association is another private club and they’ll know best which business to filter from the public view? You know, this is the twenty-first century. Co-Sponsor: Hummel, Jacob (081) … et al. What are the odds of this passing? Just asking. 610.011. 1. 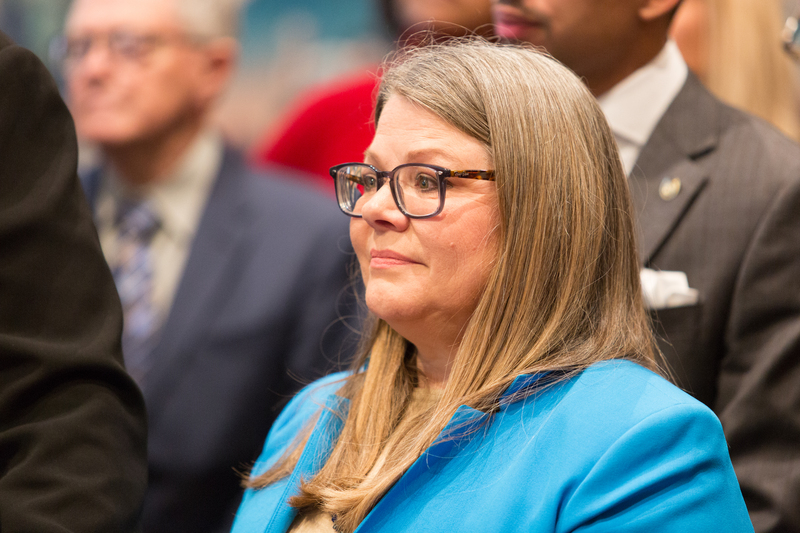 It is the public policy of this state that meetings, records, votes, actions, and deliberations of public governmental bodies be open to the public unless otherwise provided by law. Sections 610.010 to 610.200 shall be liberally construed and their exceptions strictly construed to promote this public policy. “Liberally construed” means, if there’s any doubt, err on the side of openness. The law is designed to allow very few restrictions. “Strictly construed” as applied to any exceptions means that the exceptions must match the letter of the law, well, strictly. This letter is in response to your request for records under Chapter 610, RSMo., of May 28th, 2009 to Rep. Denny Hoskins. “1. 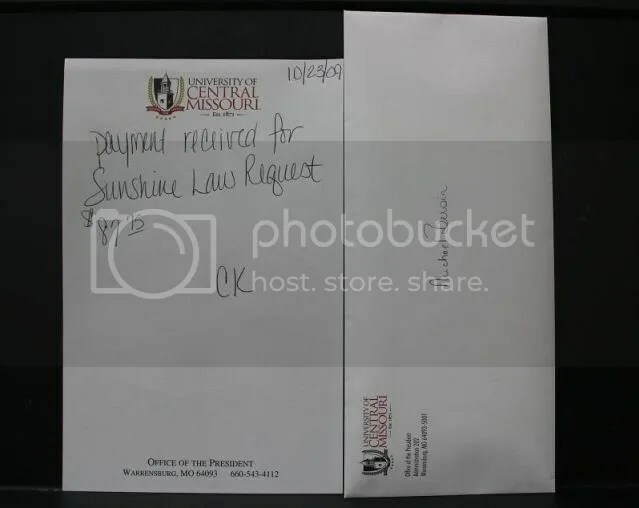 All written and electronic correspondence with administrators, faculty, and students at the University of Central Missouri concerning legislation pertaining to the issue of concealed and carry of firearms in Missouri. 1. 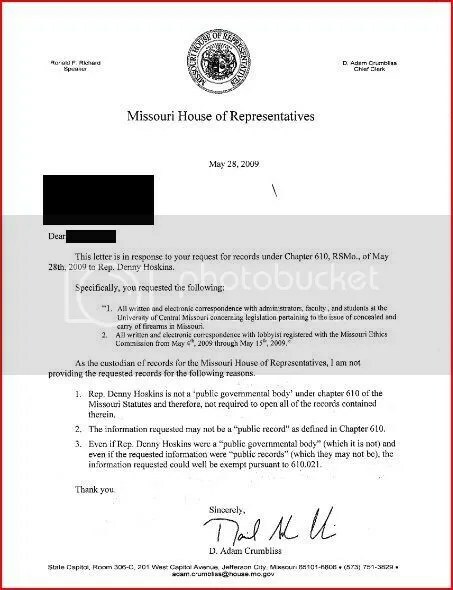 Rep. Denny Hoskins is not a ‘public governmental body’ under chapter 610 of the Missouri Statutes and therefore, not required to open all records contained therein. 2. The information requested may not be a “public record” as defined in Chapter 610. 3. 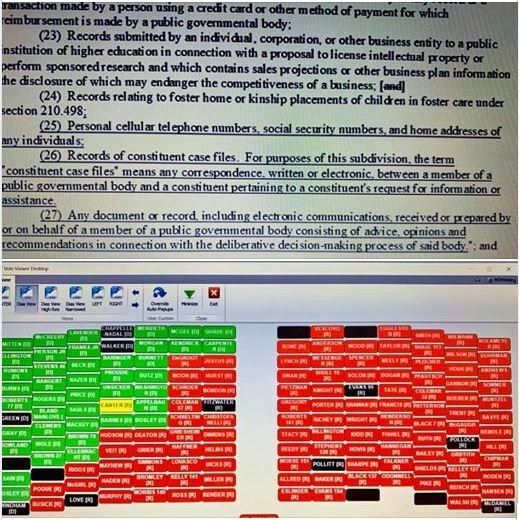 Even if Rep. Denny Hoskins were a “public governmental body” (which it is not) and even if the requested information were “public records” (which they may not be), the information requested could well be exempt pursuant to 610.021. There’s a certain irony to the assertion that the Missouri General Assembly is not a public governmental body. Then again, given the way the republican majority operates, I could see why they think that way. Then there’s that liberally/strictly construed language in the statute which this response appears to not quite address with its very mushy language (“may not” and “could well be”). (21) Credit card numbers, personal identification numbers, digital certificates, physical and virtual keys, access codes or authorization codes that are used to protect the security of electronic transactions between a public governmental body and a person or entity doing business with a public governmental body. Nothing in this section shall be deemed to close the record of a person or entity using a credit card held in the name of a public governmental body or any record of a transaction made by a person using a credit card or other method of payment for which reimbursement is made by a public governmental body. Ah yes, openness in Missouri government can be such a breath of fresh air. Not. This kind of got lost in hotflash’s Friday night post about the pre-convention reception, but just as Jeff Harris told her then, he quickly replied to Blunt’s e-mail request, saying that he’s willing to immediately turn over the 75,000 documents Blunt requested at a cost of $10,000 to the taxpayer. One extra wrinkle – the House generally maintains that individual members of the House are not in of themselves public bodies and therefore not open to scrutiny under the Sunshine Law. Harris maintains that his willingness to comply has nothing to do with the validity of the House opinion. I’m not sure why Blunt is going this route. Maybe he’s hoping that Harris can’t produce all of the documents, or that Harris might have some skeletons buried in those hard drives. But it’s egg on Blunt’s face if Harris can produce and nothing of consequence surfaces. Meanwhile, Harris gets extra press and an opportunity for a fundraising ask – Harris sent out an e-mail to his list calling Blunt’s attack a “Badge of Honor” and asked for a small contribution on behalf of the guy standing up to Blunt. There is so much irony on so many levels. It was a big bill for attorney’s fees. Yeah, read the “Exhibit 3” attached to the lawsuit.